The C. & W. M. railroad will soon be running trains to Highland Park. Thousands of strangers will visit Highland Park this summer. It is pronounced as the boss summer resort of the State. Mr. Chas. Boyden’s cottage at Highland Park when completed will be a fine addition to the Park. It will be a little ahead of anything there now. M J. Lockie will build a cottage at Highland Park at once. The lumber for the new lawn tennis grounds at Highland Park has arrived. Hiram Potts has a very able and interesting story in this morning’s Grand Rapids Democrat. Subject, Spring Lake. Mrs. J. E. Young, of Chicago, who has been visiting her parents in this city, has gone to Muskegon to visit her sister, Miss Anna P. Smith. Mrs. Young has just contracted for the building of a beautiful cottage at Highland Park. Things are starting to boom at Highland Park; the sound of the hammer is heard and building is going on on every corner and everything points to a season that will far eclipse every other one at this popular resort. Wm. L. R. A. Andres, expects to move into his new hotel Cutler in about six weeks. The bus has commenced running to Highland Park. Several more cottages besides those now being built at Highland Park are now being figured on and work will commence on them. Station agent Zellner is building a cottage at that famous resort, Highland Park.—Coopersville Observer. Hundreds of people visited Highland Park yesterday. A number of Highland Park cottages will be occupied this week for the season. Highland Park Hotel has been put in first class shape for a lively season’s business. And now the park is connected by telephone, and the next question is, when will the railroad be extended to that popular resort. The many new cottages built at Highland Park this spring add greatly to the beauty and attractiveness of the Park. The management of the Highland Park Hotel have put in a 90 barrel water tank so that the patrons of that popular hotel can enjoy soft water for their use. 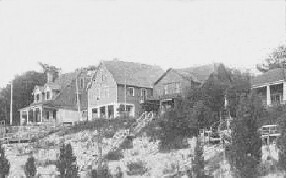 The Kirby House has been cleaned and fixed up for the season’ business and the resort is a popular resort for the traveling public. H. D. Irish of the Spring Lake House, was in town yesterday. He has just taken the management of the hotel and is very hopeful of and excellent season. The pretty lake is just at present over run by anglers. A reward of $5.00 will be given to anyone furnishing information as to the identity of the person who peeled the bark off a beech tree at Highland Park pavilion. Capt. F. A. Mansfield and David Mansfield, bell-boys at Highland Park Hotel, are drinking in the delights of the Forepaugh’s circus at Muskegon today. The new Boyden cottage at Highland Park beats them all. Mr. Water’ new cottage at Highland Park is nearly completed. John Macfie’s new cottage at Highland Park will be completed in a few days. The lawn tennis grounds at the park will soon be ready for the first game. The sound of hammer and constant arrivals of teams with lumber and building material shows that the park is having a big boom. Thirty guests registered at the Hotel Kirby yesterday. Among the registered there today were D. A. Marks and a party of six, who were enroute to Highland Park to spend the summer. Isn’t there enough ambition in some of our resort people to scare up a good monster snake story? Verily, what should it profit a resort these times if it has not a sea serpent? Perhaps though, it bespeaks well for our temperance. John M. Lockie’s new cottage at the Park will be done next week. Hundreds of citizens and strangers took in the beauties of Highland Park yesterday. W. B. Folger and wife of Grand Rapids, are in the city for a day or two. Mr. Folger has secured a lot at Highland Park and will begin at once the erection of a cottage. The lawn tennis court at the park is finished. The demand for carpenters to put up cottages at Highland Park is largely in excess of the supply. All aboard to the Park is being accepted by many of our people these warm days and the crowd going there will be daily on the increase. A very pleasant surprise party at Highland Park Hotel last evening—Miss Clara Bell, one of the popular lady teachers of our city schools, was the one who fifty of our young folks turned out to surprise, and it was a complete success and all claimed to have a good time. Dancing was the main enjoyment of the evening. The young scholars at Akeley accompanied by one of the teachers had a picnic at the park today. The eighth and seventh graders picnicked at the park yesterday. Mr. and Mrs. Geo. McBride have moved to Highland Park. Chas. Boyden and family have moved to their elegant residence at Highland Park. Mr. J. P. Brayton and family will move into their new cottage at the park next Monday. The management of Highland Park Hotel announces a social hop to take at that popular resort the night of July 4th. Hon. Dwight Cutler and family moved to Highland Park today.